This template can be used with the new Blogger in beta mode. 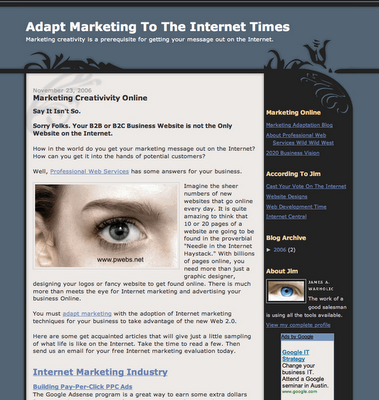 Professional blog Internet marketing for businesses in the B2B and B2C sectors. Professional Web Services provides: Internet marketing services, online advertising strategies, Web branding solutions, search engine optimization, ethical SEO, and your B2B and B2C strategic business solution for getting your website found online. Gain more customers, leads, and sales to add to your bottom line.